Billed as “a new dimension in terror”, the third in the series sees Jason terrorising a new bunch of teens and rednecks in 3D, back then a new gimmick for the audience – and boy wouldn’t it have been fun to have seen it? That is no excuse, of course, for actual content of the film – the non-existent story, the nameless characters and the uninspired, generic direction that follows so closely in the footsteps of it’s the lacklustre Part II. The film begins one day after Part II, opening with a bickering married couple going about their daily lives. Of course, their number is up – but the writers obviously wanted to stretch out the conversation, in hopes of building in tension – which it does not. This entire scene could’ve easily been edited but instead it only serves as an introduction to the effects of 3D as things left right and centre pop out at you until the husband kicks the bucket. Then the wife is next. Steve Miner returns to direct once more and the end result is a mixed bag. There are a few inspired moments here or there in the way of tension but these moments are few and far between and this film is happy to chug along from kill to kill. The writing is uninspired, somewhat pointless and by the numbers, featuring lengthy scenes with un necessary characters that drag on and lead to a boring Axe-in-the-back. There is a absolutely pointless sub plot involving main girl Chris (Dana Kimmell) who was attacked by a man wandering the woods (!) and turns out to be our favourite serial killer. Why was that needed? It didn’t build any depth for her character, she didn’t become any stronger or undergo any change by the end of the film. But I digress. Richard Brooker plays the hulking mass that is Jason – who dons the Hockey Mask for the first time – but outside of that cool slice of horror history, his presence is rather flat. Granted, the man has an air of menace about him and Jason isn’t all that frightening to begin with but whatever sparks his performance cause in the first half of the film fizzles out as Jason goes on killing. The same can be said for the bunch of nameless characters, who come off feeling flat. They would be forgivable if their parts weren’t so dull because then there’d be something to chew on or care for but they exist solely for their deaths and when those sequences are bland as well, the whole point of watching these joyless folk becomes a bit of a letdown. That being said, the cast do their absolute best with the material on display here. Their line delivery is a bit off and some of the more dramatic beats aren’t convincing but they’re all solid enough playing their roles. How’s the gore? Yeah, it’ll satisfy. It’s also a bit flat and lacks the jaw dropping presentation that Tom Savini came up with in the original but hey, Jason gets the job done and like any greasy burger, this gore will get the job done as well and is executed effectively. 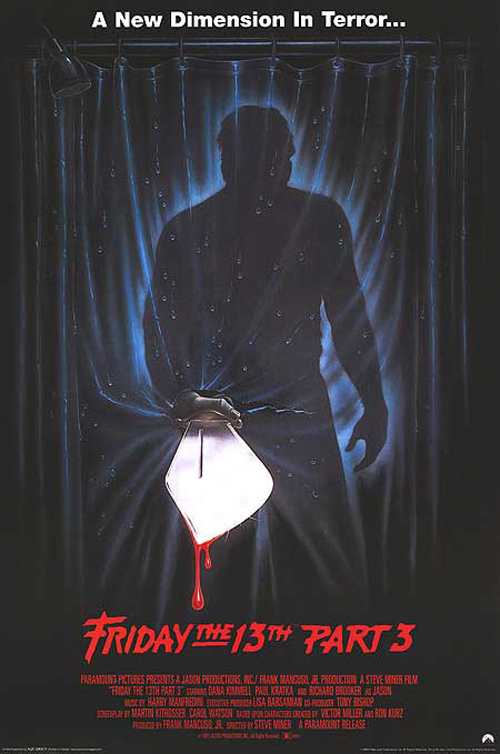 As a bit of horror film history, Part III should be an interesting watch for the horror buff. It’s infuriatingly bland but it has its moments here or there and as far as ranking the series goes, it’s not the worst of the bunch, it’s just rather lacklustre with the same silly teens dying in bland ways.